The famous Sparkman and Stephens aluminium yawl took line honours way back in the 1971 race when owned by the famous American yachtsman Jim Kilroy. Made her comeback last year under current owners Paddy and Keith Broughton when she finished 68th across the line, after breaking her boom and 56th overall. Veteran navigator Lindsay May will again be on board for his 46th race south joined by RYCT Vice Commodore Stephen ‘Rowdy’ McCullum. Between the crew there is over a combined 200 Sydney Hobart Races with the crew having strong family ties including father & son, husband & wife and brother combinations on board. “In 2018 we continued the process of restoring the sailing and racing systems on Kialoa II such as the pedestal winches, boom and mast. 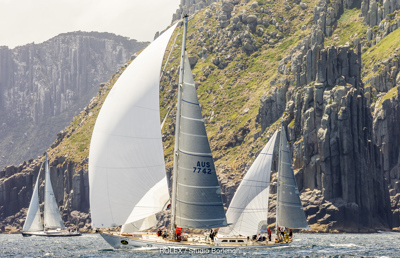 Keith and I are looking forward to the challenge of another Rolex Sydney Hobart Yacht Race on Kialoa II with our friends,” said Paddy Broughton.